Who are Innotec Hygiene Solutions? These Accessories enable the decontamination of a room or vehicle without entering. Ideal for treatments where there may be no power source in target area e.g. Toilet and bathrooms and prevents potential hazards of using extension cables. 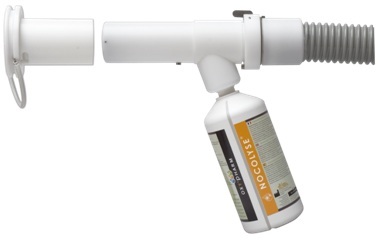 Creates time for further treatments as the Nocospray can be moved and utilised immediately after diffusion rather than remaining in treatment area during the settlement phase. Significant benefit in areas such as vehicular fleet and Cruise liner cabin decontamination. To be used with Nocospray and any of the 1L bottles of chemicals. The cap on the inlet is clipped on after treatment which may be locked for security. 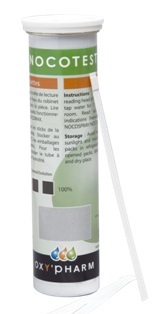 Nocotest is a tube of 100 colorimetric strips that detect the presence of hydrogen peroxide. Nocotest strips should be placed in a room prior to treatment in a variety of areas and their placement noted. The detection tabs on one end of the strip will change colour in the presence of hydrogen peroxide. The colour change informs that the diffusion was successful and evenly distributed within the room. Nocobox are Petri Dish contact plates with an agar medium to detect the presence of microorganisms. Nocobox should be used to take samples from surfaces both prior to and after treatment. Once left to culture, Nocobox may be observed for results after 48 hours. 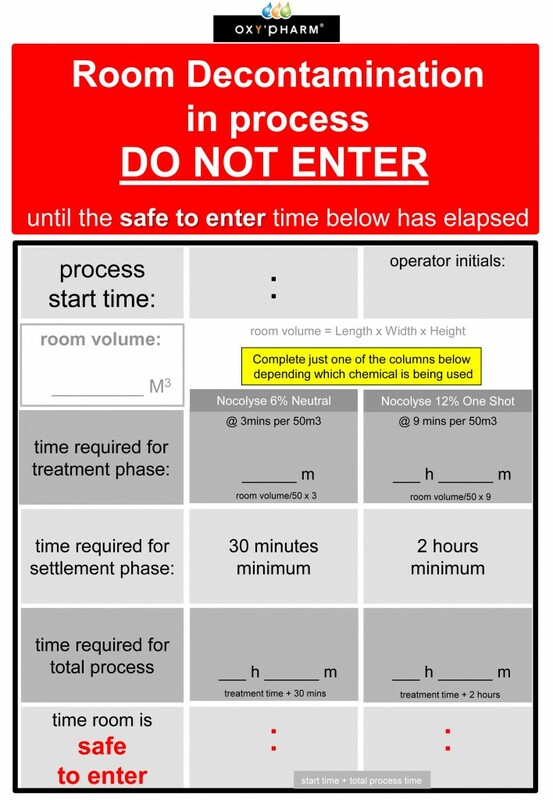 This is a sample of a door safety chart to be used when activating the Oxypharm system. © 2017 Innotec Hygiene Solutions.